On days where I get very little sleep the night before, I like to throw a bunch of fruit in my blender and make a delicious smoothie or shake. 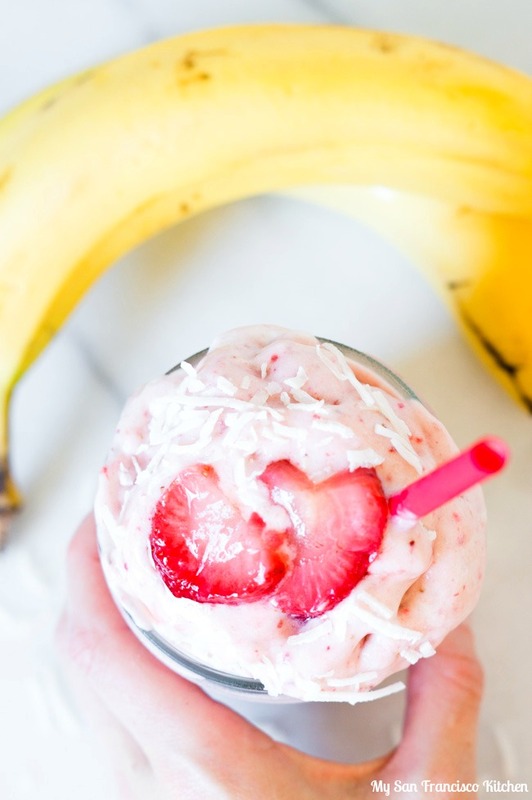 This strawberry banana coconut shake is one of my favorite fruit-based drinks. It is made with coconut cream instead of ice cream, so it is still nice and thick, but healthier. I was reading an article on coconut oil and coconut milk, because like many people I was concerned with the high saturated fat content in them. Apparently, the saturated fat in coconut is healthier for you than the saturated fat in animal products, since it is chemically different and has been shown to increase HDL (the good cholesterol). Most health practitioners still recommend using it in moderation since the studies we have at this point are short term. I love using coconut milk in curries, but I never though about using it in smoothies before. 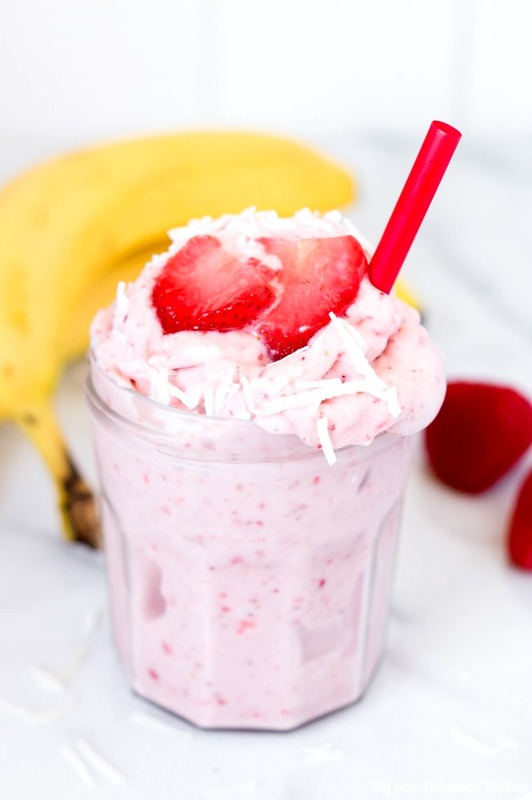 I actually used coconut cream from Trader Joes in this strawberry banana coconut shake, which is thicker and creamier than just coconut milk. You have to try it! I also use frozen bananas to make my shake nice and thick. I like to use a mix of fresh and frozen strawberries, and unsweetened coconut flakes for the topping. Hopefully we will get more sleep around here soon. I am curious to see the next crazy thing I do in this state! 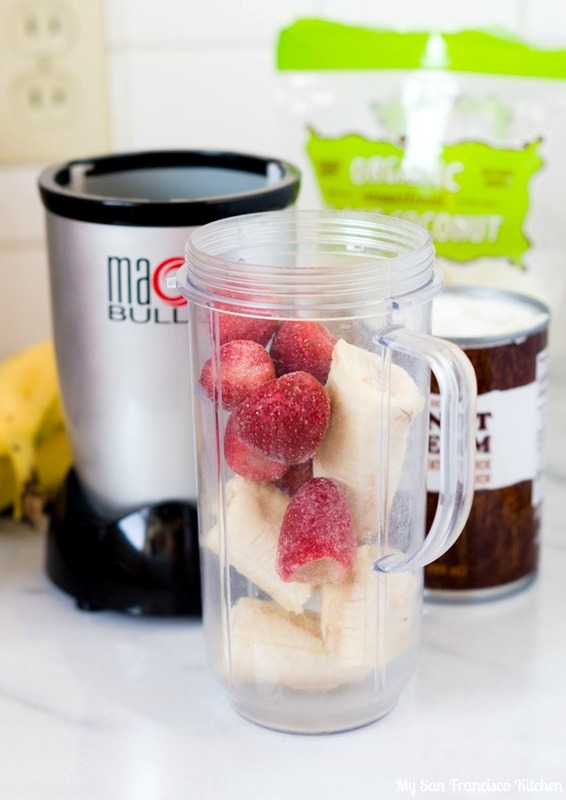 Add all ingredients to a blender and blend well. Add water as needed to get things moving! This entry was posted in Breakfast, Dessert, Drinks, Organic, Vegetarian and tagged banana, coconut, shake, smoothie, strawberries. What a fabulous use of left over coconut cream. Looks delicious! oh this looks so gorge! Loving the pretty pink. This looks wonderful, so simple and colorful. Thanks! Im SWOONING over this perfectly thick and creamy smoothie! Its like a healthy milkshake in disguise! I just tried this, with the addition of unsweetened whey for some protein. It was fabulous! The shredded coconut seemed a bit frivolous for my daily shake, but I had it on hand so I gave it a try. It was so much fun eating the shake with a spoon, like a frozen desert! I mounded on more coconut as I worked my way to the glass bottom. I’m looking forward to making more later with the kids. Thanks!